Today was Book Club day! It was so nice and sunny outside I decided to walk over to the house it was being hosted at. The lady that was hosting it lives really close to my brother so I knew it would only take me a few minutes to walk there. I went outside and quickly decided that I had better take a sweatshirt! After I started walking I was thinking to myself how deseaving the sunshine had been. It was COLD! It was WINDY! But it wasn't too far to go so I just told myself I was fine and to keep on walking. When I got there all the other ladies but my Mom and my neighbor that lives two doors down were already there. This was my first time in this house and it was very cozy inside. The walls were a nice light wood paneling and the ceiling was also done in the same light wood with the open beam look. All the houses out where I live are so unique it's always fun to see what someone else has! She had a lot of pictures of cats and foxes and cute little little girl type things around the house, like stuffed little kitties peaking around the corners. I came in and sat down and set down my books that I had brought with me. I'm not one to hold onto books long so I had brought a book my Mom had bought me and wanted to read (Dewey:The Small Town Library Cat Who Touched The World), Barefoot, and The Last Summer of You and Me to pass along. I had a taker for The Last Summer book but poor Barefoot came home with me. Everyone was having a glass of wine but I opted for a bottle of water, I'm really not a wine drinker. Maybe I should be come one though. I always see how cheap some of the bottles are when I got to Costco! My Mom got there after a few minutes. Everyone sat around and chatted which is what most of the bookclub is about! I have to say this time though I don't think there was any gossip! I think that was a first. Everyone thanked me for the bookmarks I had made for Christmas gifts (those were the first ones I had made!) and the hostess told us she had bookmarks she had bought awhile back for us but they looked plain compared to the ones I had made. I felt kind of bad! I made sure to get up first and go check them out and picked out a cute one with a dog and cat on it. Eventually we got around to discussing the book. 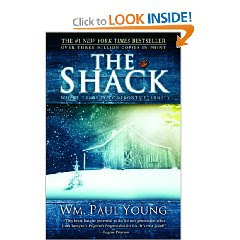 It was The Shack. I actually read it way back in early December so it wasn't real fresh in my mind. Everyone talked a bit about what they thought about the book and I was really surprised by what people said. Book club member #1 said that she believes in reincarnation. Book club member #2 read the book, and then reread it a second time. She said the second time she read the book she didn't like it as much as the first because she felt the author had put things in to make it appeal to different religious things. Book club member #3, the one that was hosting and had picked the book mostly just said she thought it was a great book, and had heard one woman (not in bookclub) say it changed her thinking about God. Book club member #4, who was raised Catholic, said she liked the book as a "Book" but not as something to teach you about how God is. Book club member #5 said she had a hard time dealing with the fact that the bad person in the story is accepted the same as the non bad people. Book club member #6 said that she thinks life is like a path and you have to go through each step to get to where you are going (but kind of like a choose your own path/ending way). Pretty much everyone said that they believe we are in this life to help us build up our souls to go onto the next life. All in all very interesting listening to how others interpret the book and their different takes on religion and how things work when you die and in the afterlife. 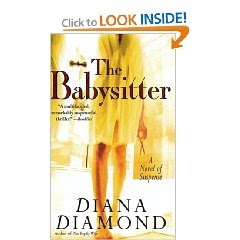 Our next book to read is The Babysitter which looks pretty interesting. It's like having seasickness/experiencing an earthquake and having a migraine all at once! IKKY. if you want to start drinking wine mix it half and half with 7 up. VERY GOOD! that's the only way I can drink it. and stay away from red wines. blech. I like how you wrote your post. It is nice to see what other people thought of the book. I look forward to reading your book club post for the next book! Enjoyed your post! I also like hearing about all of the different opinions on the book. Keep up the good work! And don't worry about the wine, you only get the hangover if you drink too much. Sipping one glass shouldn't bother you, especially if you mix it with 7-up, as suggested earlier. It's not too bad!